New York, NY, November 3rd, 2018 - Jazz Trumpeter and composer Bill Warfield, along with the Hell's Kitchen Funk Orchestra will perform at Zinc Bar, 82 West 3rd St., New York City on Friday, November 16th, show time 10 PM to 11;30 PM. A dynamic and innovative composer, bandleader and trumpeter, Bill Warfield has energized audiences, performers and writers for more than four decades. The Hell's Kitchen Funk Orchestra is a group of jazz artists that facilitate and explore the bond that exists between musicians from many countries. Their latest CD is Mercy, Mercy, Mercy, released on the BluJazz Label. This CD is a celebration of the composer's formative musical experiences. 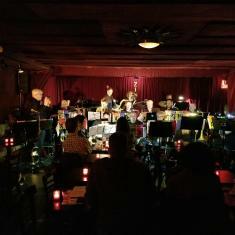 The Hell's Kitchen Funk Orchestra performs compositions born of the genres of funk, contemporary and Latin Jazz while embracing the varied backgrounds and experiences of its members. Audiences are treated to high powered contemporary music that communicates, transcends and inspires. Mercy, Mercy, Mercy is a return by Bill Warfield to his Rhythm and Blues/Funk roots. Most often known for Big Band and Jazz Orchestra recordings, Bill uses all of the modern harmonic and melodic elements found in his big band recordings and applies them to this rockin' new funk ensemble. Tunes as eclectic as Joe Zawinul's Mercy, Mercy, Mercy to Tito Puente's Fiesta a la King to Ohio Player's Fire to Benny Golson's beautiful Jazz standard, Whisper Not, make this set of music have something for everyone. The band's foundation will be provided by Bill Warfield--band leader and on trumpet and flugelhorn, Jane Stuart on vocals, John Eckert on trumpet and flugelhorn, Andrew Gould on alto sax and flute, Dave Riekenberg on tenor sax, soprano sax and flute, Matt Hong on baritone sax and flute, Matt Chertkoff on guitar, Cecilia Coleman on piano, Steve Count on bass, Scott Neumann on drums. Besides composing and conducting, Warfield currently teaches and directs the Jazz Program at Lehigh University. Previously he taught at the Dalton School in NY, Brooklyn College, Towson University, and University of North Florida.